One may refer https://www.gst.gov.in/ for further details for GSTN related process/news/video/user guide etc. Dealer will have to open GSTN Portal (www.gst.gov.in) for further Enrolment Process. Login as new user (For first time log in), i.e. click the NEW USER LOGIN Icon. A declaration will appear on screen as auto flow. Check on Declaration Box at left hand corner, and Click ‘continue’ button, which will be activated once you checked the declaration. Enter provisional Id obtained from Punjab Excise and Taxation Department(PETD), in the next window. Enter password provided by Punjab Excise and Taxation Department. Enter Captcha ,shown in image above login option in the box provided (above captcha image). Press ‘login’ to continue to next step. Enter valid email and mobile number of the authorized signatory. The email id and mobile number must be of authorized signatory only. In no case E­mail id and mobile number of Tax Professional should be provided during enrolment. Please note that all future correspondence from the GST Common Portal will be sent on this registered mobile number and email id only. Any change will be non­editable till 01/04/2017. Click ‘continue’ to go to next step. Enter OTPs received on email and mobile in respective boxes. Different OTPs will be received on Email and mobile (User must be careful as OTP received on e­ mail id and mobile will be different). Take care to enter OTPs in their respective boxes as any error in this process will lead to repetition of the process undertaken earlier. The OTP received on your email Id and mobile, will expire in 15 minutes. In such case request for new OTP’s by clicking on’ Resend OTP’ button. Enter the new user name and new password for subsequent log in. User name will be of your choice, if it is available. You can check the availability at this stage. Password would be of your choice. However it should contain one capital alphabet, one numeric and one special character. Re­ Confirm the Password. Click continue for next step. Answer security questions. This is required to reset password in case user forgets the password. It is mandatory for the user to answers all the questions provided in the link. Click submit button to continue. 1.Five fields will be auto populated and non­editable. Legal Name of business as per current Tax Act. Provide Registration Number and Date of Registration. click ‘Add ‘ and fill details of such registration. Required document upload­ Proof of constitution of business. Enter details of your stakeholders including their PAN details. 1. Enter details of Primary Authorized Signatory . Provide all relevant details like Name, DOB, and Residential Address. Proof of appointment of Authorized Signatory. The File should being PDF or JPEG Format and not larger than 1MB..
3.Take Picture: You can upload photograph of Primary Authorized Signatory by taking a selfie with your device camera. Enter details of Principal Place of Business. Upload proof of principal place of business. The file should be in PDF or JPEG Format and not larger than 1 MB. Select relevant option of ‘Nature of Business Activity being carried out’. You can select more than one option. Enter details of additional place of business. Click on Add place of business to add details of other place of business. In the Goods and Services page, enter the HSN (Harmonized System of Nomenclature) Code of the goods and commodities your business deals with. Please specify top 5 goods/ commodities supplied by you. On specifying goods and commodities you can search respective HSN code to enter. In case you are dealing with services enter the SAC (Service Accounting Code) of the services offered by your business. Enter your Account Number, type of account and IFSC code of bank branch. In case IFSC Code is not known, click on provided link to find IFSC code of your bank branch. You can add up to 10 Bank Accounts while enrolling with GST Common Portal. Click on Save and Continue to go to the next step. Submit details with E Signature. Submit details with Digital Signature Certificate (DSC). DSC is mandatory for enrollment of Companies. 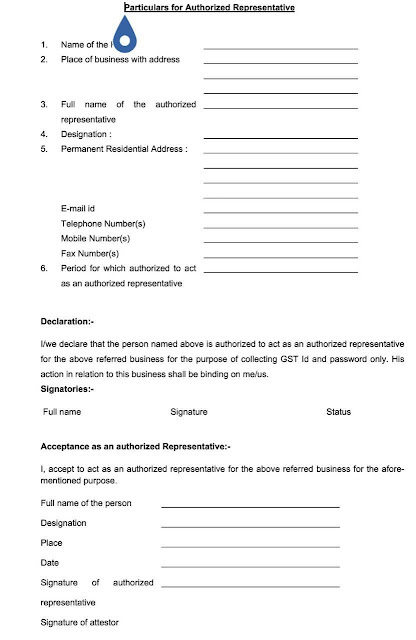 Fill in the Name of Authorized Signatory, Designation, Place and Date. Click on Verification box on upper left hand corner. Select Digital Signature Certificate (DSC) from pop up window. You cannot submit Enrollment Application if your Digital Signature Certificate (DSC) is not registered with the GST Common Portal. Therefore you need to register your DSC at the GST Common Portal by clicking on Register DSC menu. On successful submission, message will be displayed on screen. You will also receive notification with unique Application Reference Number (ARN) on your registered email address and mobile phone number. System will verify / validate the information submitted. 1.When filling the details of business, proof of ‘Constitution of business’ is required to be uploaded in PDF or JPEG format. 2. In case of proprietorship business, such document proof may not be available. In such case, Registration Certificate(RC) under VAT, in which proprietorship is mentioned can be used. 3. In case such RC is not available, other RCs such as under Shops and Establishment Act may be used. 4. GSTN has VAT registration data only up to December 2015. Registrations after December 2015, will not be migrated for now. 5. 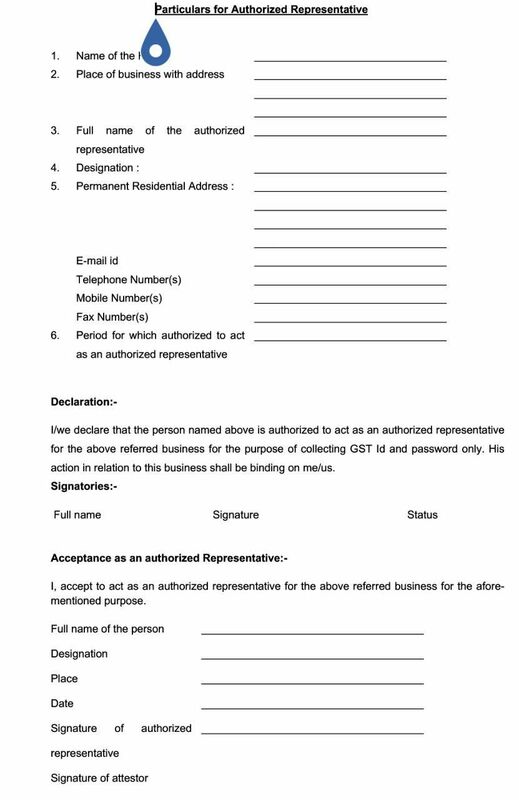 E­signature facility is not activated at the end of GSTN. Either e­signature or Digital Signature Certificate(DSC) is essential for submission to be successful. 6. Thus, every registrant will need to have a DSC which involves a cost. Great post i like it. Thanks for sharing it. Actually i was searching information about Central Excise Registration.